When planning an extended stay in Bend, a hotel just doesn’t seem to cut it. Sometimes you need something a bit cozier, something that feels like home. And a bed and breakfast may be just what you are looking for. Looking for a vacation rental? See our top picks on Airbnb! Bend has some great B&B’s to choose from with easy access to all of the food, shopping, and activities the city has to offer. You can enjoy a comfy bed with fresh linens, a home-cooked meal, and a relaxing environment at each of these top B&B locations. In addition to a general overview of the facilities, you will find a short interview with some of the owners. With a sneak peek into each of the B&B locations, you can get to know them a little so that your stay will feel a bit more personal. Housed in a 1910 historic craftsman home, Lara House Bed and Breakfast is a luxurious, adult only inn. The facility overlooks Drake Park and the Deschutes River, only two blocks away from downtown. Lara House offers six rooms with their own unique styles and designs. Each of the rooms are smoke and pet-free, so there is no need to worry about allergies or foul odors. You can even rent out the entire house for your special event or family gathering. More than just a room, Lara House offers fresh cookies as well as beer and wine hour at no extra charge to you. A multi-course breakfast with hot tea is also included in your room rate. Start your day with a cup of local Thump coffee while you enjoy fresh fruit or yogurt with granola before your main course, which switches daily between sweet and savory. What’s the story behind your Bed & Breakfast? The Lara House was built by the Lara’s in 1910. At that time, the Lara’s would house out of town guests while they owned the home. The Lara’s sold the home in 1919. During the Depression, the Lara House was a boarding house, and during WWII, it housed army families, of soldiers stationed at Fort Abbot in Sunriver. 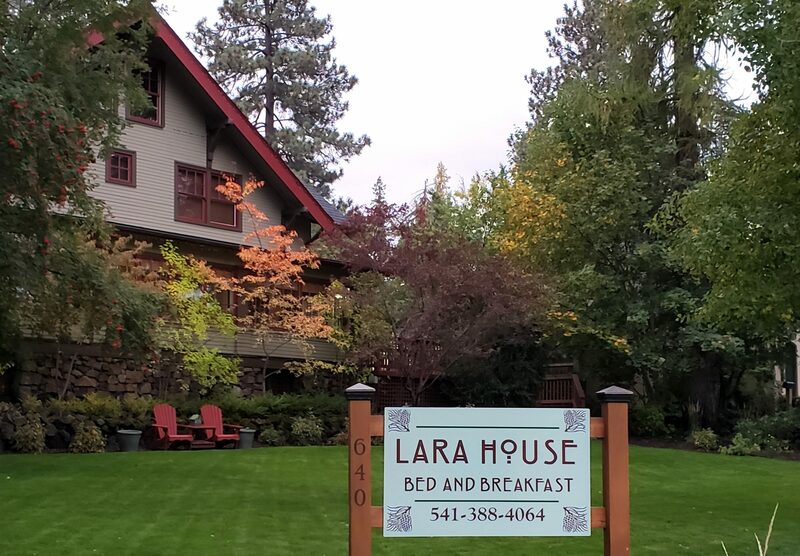 The Lara House has been a bed and breakfast off an on for over 50+ years. It has been run continually as a bed and breakfast since the early 1980’s. I have owned the bed and breakfast for the past 6 years. We are a family owned and run bed and breakfast. What’s your favorite aspect of having your own Bed & Breakfast? My favorite aspect of having a bed and breakfast is the people that I get to meet and being a part of the Bend community. The Lara’s were a big part of the community back when they owned the house in the early 1910’s and we are working to have the Lara House play an important part in the Bend community as well. What makes the location of your Bed & Breakfast an ideal place to stay in Bend? The location of the Lara House couldn’t be more perfect. We are a block and a half from downtown and across the street from Drake Park! Our guests can walk to dinner, boutique shops and the park. No need to get back in the car in the evening or for any downtown events. What is your idea of the perfect Bed & Breakfast experience? My idea of a perfect Bed and Breakfast experience is a seamless stay, that makes the guests feel pampered, not needing to ask for anything and give them the feel of a boutique inn. Our Mission Statement is “More Than Just a Room”. Included in the room rate is a multi course breakfast, wine and beer hour, freshly baked cookies, bottled water and sodas. There is nothing that the guests need to pay extra for. Come, relax and enjoy is what we want out guests to be able to do. Book your stay at Lara House B&B now! The perfect little B&B if you like the wide open space that a country setting has to offer. Sunny Acres is situated on 2.5 acres of beautifully landscaped property, with plenty of room for you to find a quiet place to relax. Each room has its own unique style. The Cabin Suite is pet-friendly and adds a bit of a rustic touch to your Central Oregon getaway. The Cottage Garden transports you to Europe, imagining you are in a quaint English village. And the Safari Room’s name speaks for itself; you will feel like you have just stepped off the ship to Africa. In the backyard, you can enjoy a variety of activities from disc golf to croquet, washers, and horseshoes. You can even cozy up by the firepit enjoying an evening with your family roasting marshmallows and stuffing yourself with s’mores. Don’t let the spacious countryside view fool you; Sunny Acres is actually located only minutes from downtown Bend. So you, your pup, and your family can easily explore the town, grabbing some local bites and brews while you shop to your heart’s content. 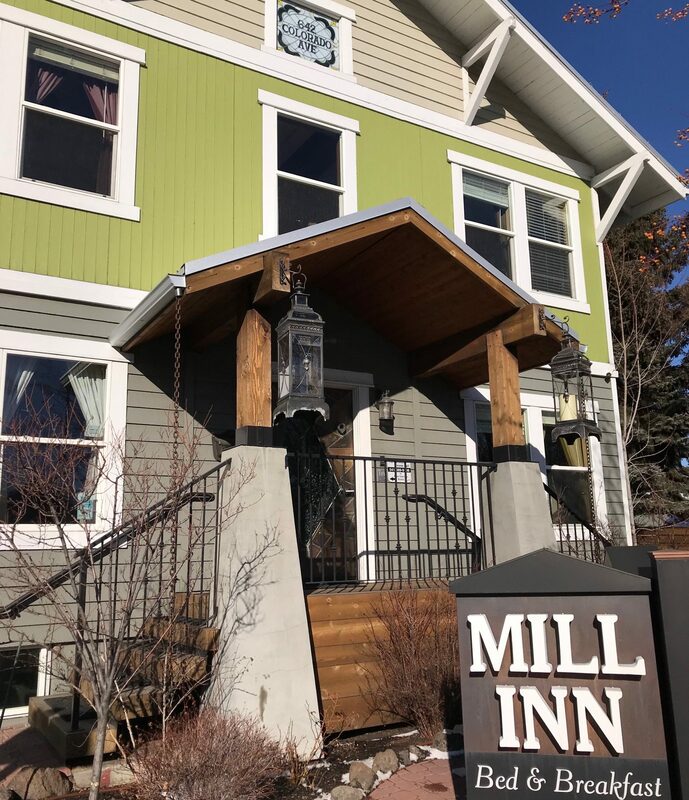 Located only six blocks from downtown, the Mill Inn Bed and Breakfast is a great place to relax after a day exploring Bend and all that this cute town has to offer. They are also within walking distance from the Les Schwab Amphitheater which offers good summertime fun with free concerts on the weekends. The Mill Inn offers 10 unique rooms – each with its own theme – with gorgeous furnishings and various bed sizes to meet your needs. For a weekend getaway with your besties, stay in the New York Twins room; for something a little more romantic, you can book the Romance Suite with king bed. It’s tempting to stay in this cozy little inn, but coming to bed, you are likely looking for a bit of adventure too. No worries! The Mill Inn offers gear storage and ski wax station to keep your winter gear in check; they also have laundry facilities to wash your sweaty clothes after a long summer’s day hike. Spending time at the inn is worth your while too. You will wake up to a homestyle breakfast, enjoy wi-fi and cable TV in your room, and a BBQ and cocktail deck with hot tub to relax after a long day. 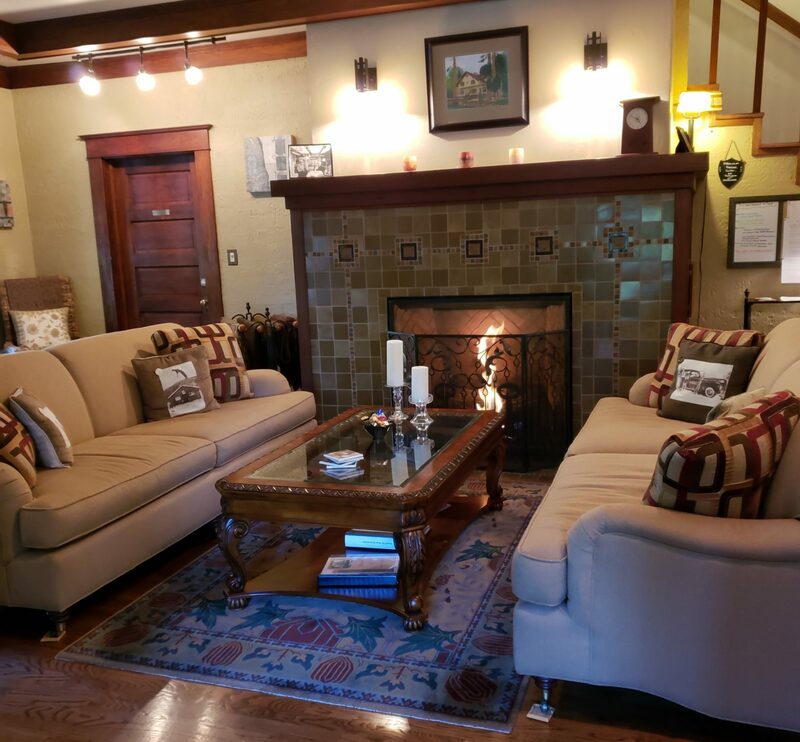 Ranked the #1 bed and breakfast in Bend, the Hillside Inn is a cozy little spot if you are looking for some privacy without a bunch of other guests around. Located within walking distance to Drake Park with its famous Mirror Pond, this location is ideal for those who are looking to walk or bike to Bend activities. There are two master suites at the Hillside Inn – both with private bath – located in a separate wing from the inn’s kitchen, living area, and dining room. Each has access to an outside patio with access to the hot tub and fish pond with waterfall. So, you can enjoy a quite evening relaxing in the outdoors. The inn is eco-friendly, recycling all paper, plastic, glass, and cans used on site, and there are no plastic bottles used for guest refreshments. Their breakfast features a healthy menu with ingredients from local markets, striving for low carbs and fats as well as organic options when available. Nothing compares to a mountain view, especially when they are the Cascades in Central Oregon. Juniper Acres Bed and Breakfast sits on 10 acres of woods with a view of the 7 Cascade mountain peaks from each room. Each room is personally prepared by the innkeeper herself and has access to a private bath, sitting area, TV, and air conditioning. You also get a home-cooked meal each morning prepared by the innkeeper as well as fresh cookies to snack on throughout the day. 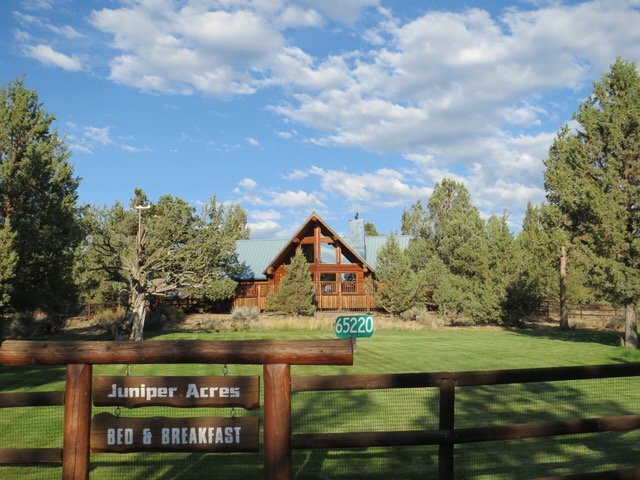 Juniper Acres is a great place to stay if you want to explore more of Central Oregon outside of Bend. Located off Highway 20, you are 6 miles north of Bend, 12 miles east of Sisters, and 14 miles west of Redmond. Innkeeper Della always loved to cook and visit with guests. We have been in business since 1991. That may be a record in the B&B business under one innkeeper. Meeting new people from all over the world. Well, it’s not for everybody, but if you like old growth trees and awesome mountain views plus the best breakfasts in the business, you’ll love Juniper acres B&B. A peaceful stay in the country with FRIENDLY hosts. We are only about 7 minutes from Bend.